It has often been said a week is a long time in politics - it also applies to sport. 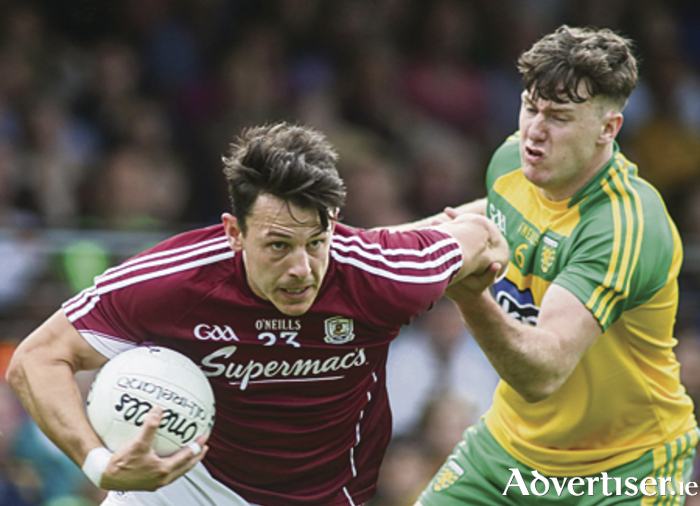 No doubt the 13 days between Galway's horrid defeat to Roscommon in the Connacht final and their 4-17 to 0-14 victory over Donegal last Saturday must have seemed like a very long time for the Galway senior footballers and the management team. At least Galway had a chance to redeem themselves quickly after their "no show" in Pearse Stadium and there was much more urgency, work-rate, collective intensity, and desire to win on display in Markievicz Park. For those supporters who walked the pitch afterward the game it was obvious the Galway players were genuinely pleased to have put the Connacht final behind them and given themselves a chance to test themselves again in an All-Ireland quarter-final at Croke Park. Their willingness last weekend to dive on breaking ball and put in the hard yards and tackles, as typified by some big hits by Gareth Bradshaw in the middle of the defence, powerful play by Paul Conroy and Damien Comer around the middle, and the incessant running of Johnny Heaney, is the template on which the team must build - and bring bucket loads to the Big House this Sunday for their clash with Eamon Fitzmaurice's Kerry. In their championship successes this season over Mayo and Donegal, the Galway footballers have started the contest with real intent and conviction. They rattled over three early points against Stephen Rochford's men and were out of the blocks early doors last Saturday too. Galway are 5/1 outsiders to take down the 2014 All-Ireland champions and current division one league champions, and they need to hit the ground running at 2pm this Sunday if they are to have any chance of doing so. Galway need to start with conviction and self-belief and lay down a few early markers. They have to let Kerry know they are not in Dublin to make up the numbers and that they do not intend being cannon fodder for anybody. In that regard, it is vital Kerry are not allowed to score a flurry of early points, especially an early goal, or Galway will face a serious uphill challenge. The dogs in the street know the Kerry full-forward line of Paul Geaney, Kieran Donaghy and James O'Donoghue are serious operators and they will have to be held, as best they can be, for the full 70 minutes. Geaney scored 1-04 from play and O'Donoghue hit 0-7 (4fs ) in their facile 1-23 to 0-15 win over Cork in the Munster final, and the Galway full-back line cannot be left one-on-one with lots of space in front of them against such quality opponents. How Kevin Walsh and his management team set up to try to nullify that scoring threat from Kerry will be very interesting. Will they go with Eoghan Kerin, Declan Kyne and Cathal Sweeney again, or will they make changes in that line? Regardless of the personnel selected in the Galway full-back line, they will need defensive support from their half-back line and other players out the field. They cannot be left isolated with good ball coming in from out the pitch or Bernard Power will be a busy man. The ideal way to nullify the threat of quality opposition full-forwards is to stop the supply channels, and in that regard Galway will have to try to go out and dominate the middle third. The team wearing maroon will need powerful displays and hard running from number five up to left half-forward with guys such as Conroy, Flynn, Heaney, Comer, Daly, Walsh, Bradshaw, team captain O'Donnell, and Silke, if he is at wing-back, to keep the Kerry lads on the back foot. Kerry's Anthony Maher and David Moran are experienced and powerful men around the middle, and Paul Conroy and Tom Flynn will have to be full of energy and running from the first throw-in and really have to have a cut off them, to give Galway a platform in that area. Power's kick-outs will have a role to play in that regard too. Conroy is vital to the Galway cause on Sunday and when he tears into the fray - in an aggressive but controlled way - others follow. Paul needs to be Galway's 'Dog Of War' around the middle on Sunday and he should get plenty of support in doing the hard lifting around there from Damien Comer, who thrived being a bit further out the field against Donegal. That duo need to set a mood of pure raw maroon defiance for the first 20 to 25 minutes and, if they do that, then Galway's inside forwards of Ian Burke and Seán Armstrong, who were both very impressive last Saturday, can trouble the Kerry rearguard. Kerry teams will take a team apart limb by limb if they are allowed, and smile as they do so. But if a team sticks with them hard into the last quarter, they are well capable of blinking, as Dublin have made them do regularly in the past few years and Donegal did in 2012. Almost every football supporter in Ireland, and every pundit is predicting a Kerry win this Sunday afternoon. The handicap is Galway plus six, which tells you what the bookies believe too. From that perspective, there is no pressure on Galway, and they have a chance to prove everyone wrong. Kerry have not been tested this year in the championship with only wins over Clare and Cork in Munster under their belt. Hopefully they will have been well tested by 3.30pm this Sunday. It is almost impossible to look past a Kerry victory, but if Galway can still be in the hunt after 50 or 55 minutes, then who knows what could happen. Galway supporters will travel to Croke Park in hope; the team needs to travel with steely conviction and belief.